These are portable shelters used in parties and weddings and are made from superior quality fabric, which ensures their excellent strength and longevity. Maharaja Tents are widely known for their attractive designs, optimum tensile strength, maximum space utilization and good resistance to moisture. They are perfect for resorts and is highly durable, easy to install, exquisite in finish and resistance to tear. They are designed to provide the perfect feel of luxury while in outdoor trips. 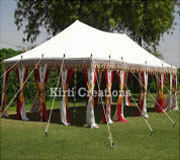 Perfect for decoration, these beautiful Indian Maharaja Tents are adorned with a vibrant color fabric. These breathtaking Indian Maharaja Tents feature a stunning cut work design and enhance the decor of the place where installed. Indian Maharaja Tents exhibits a sense of lavishness and attracts every passerby.